According to the 2015 The Lancet Commission on Health and Climate Change, the impacts of climate change threaten to undermine decades worth of progress in healthcare. Shifting weather patterns, changes in air quality and spread of vector-borne diseases pose significant risks for people’s health and well-being. Given its far-reaching implications and associated public health costs, combating climate change could also be the greatest opportunity to improve human health.34 At Johnson & Johnson, we recognize our responsibility to contribute to the global effort of tackling climate change and moving towards a low-carbon economy. Supporting responsible climate and energy policy around the world. See EHS&S Governance for more information about our management approach. Johnson & Johnson established its formal energy management program more than 30 years ago. We have developed a good understanding of our operational GHG footprint and have programs in place to address it. We also evaluate the potential operational, physical and financial risks and opportunities associated with climate change. Disruption of supply due to extreme weather events as well as water and resource scarcities are among the most direct potential climate change risks to our business. We continue to improve our internal global energy management system and align it with ISO 50001–Energy Management standard requirements. Currently, several of our European sites are certified to ISO–50001. Building on successful implementation of public emission reduction commitments over the past decade, in 2015 we set new science-based absolute emission reduction targets for our Scope 1 and Scope 2 emissions sources. 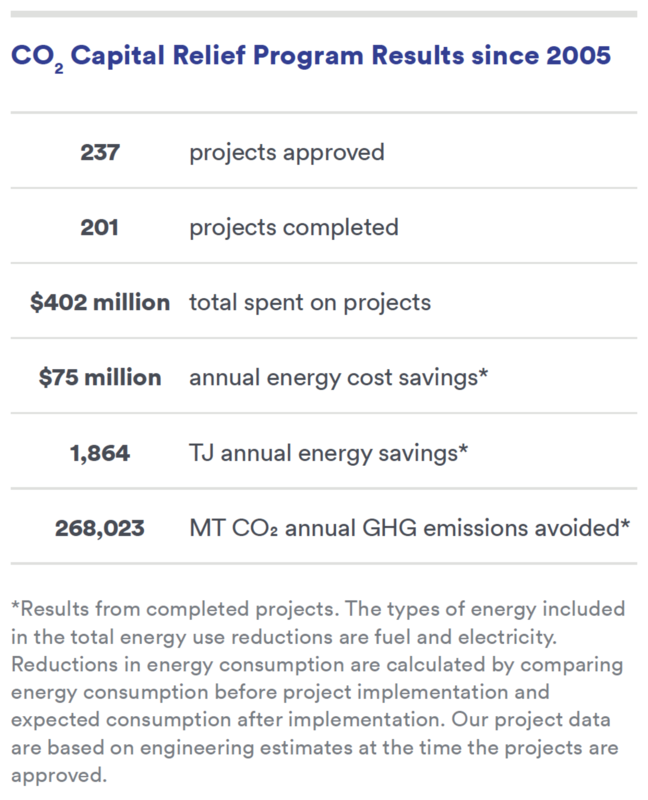 In addition to this report, we disclose our performance against these public commitments through the CDP Climate Change Program using the methodology of the GHG Protocol issued by the World Business Council for Sustainable Development and the World Resources Institute. We have been participating in the CDP climate disclosure program for more than a decade, and have been evaluating the risks and opportunities associated with a changing climate; last year we achieved a rating of A-. We focus our emissions reduction efforts on three main areas: reducing energy demand and maximizing energy efficiency in our operations; shifting to low-carbon and renewable energy sources to meet the remaining demand; and improving our influence over the Scope 3 emissions in our value chain. Through our CO2 Capital Relief Program, we continue to implement efficiency programs designed to optimize the largest energy-using systems at our most energy-intensive manufacturing and R&D sites. 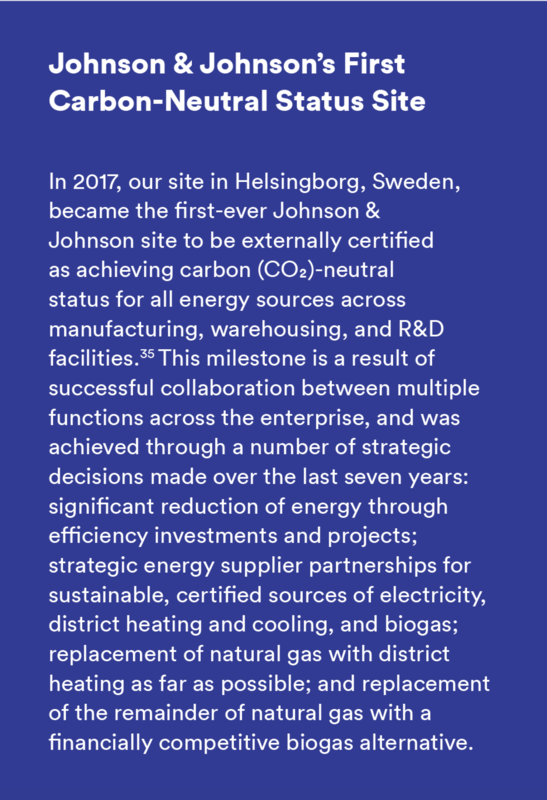 Launched in 2004, the Johnson & Johnson CO2 Capital Relief Program provides up to $40 million per year in capital relief for energy projects across our sites worldwide. To be eligible for funding, projects must demonstrate potential energy savings, and must provide a financial return of 15% or higher. Since its inception, the Capital Relief Program has funded 237 projects, with 20 of those completed in 2017. These programs are resulting in significant reductions in both energy and water use. In 2017 we approved 24 new projects and spent a total of $20.6 million focused on the following areas: installation of LED lighting; energy efficiency improvements in our chilled water; HVAC; compressed air systems; and our most significant energy investment to date, a large geothermal project in Europe. Reduce our impacts on climate and water resources. Reduce absolute carbon emissions 20% by 2020, and 80% by 2050. CO2 emissions decreased by 21% globally since 2010 (Scope 1 and Scope 2). Shifting to zero or low carbon energy sources is another priority in our strategy to reduce operational GHG emissions. Our approach is based on both on-site and off-site solutions. In 2017, approximately 25% of the Company’s electricity consumption was from renewable sources, including solar photovoltaic (PV) and wind technologies. By the end of 2017, our installed on-site clean energy technology capacity was 54.7 megawatts (MWs). This includes renewable sources like solar PV, wind, and geothermal and clean sources like co-generation and fuel cells. Our current renewable energy strategy also includes procurement of renewable energy and the associated certificates from off-site systems. As part of our Health for Humanity 2020 Goals framework and with an eye toward the future, we set an aspirational target to substantially increase our electricity consumption from renewable resources by 2020 and power all our facilities with renewable energy by 2050. In 2016, we signed a long-term power purchase agreement with E.ON Climate & Renewables for the output from a 100 MW wind farm in Texas, marking an important milestone toward achieving these targets. We began receiving the benefits of that wind power in January 2017, significantly increasing our renewable electricity consumption. Currently, we are exploring additional power purchase agreements globally to support the development of renewable energy in other countries and further strengthen our renewable energy portfolio. Produce/procure 35% of electricity from renewable sources by 2020; aspire to power all facilities with renewable energy by 2050. 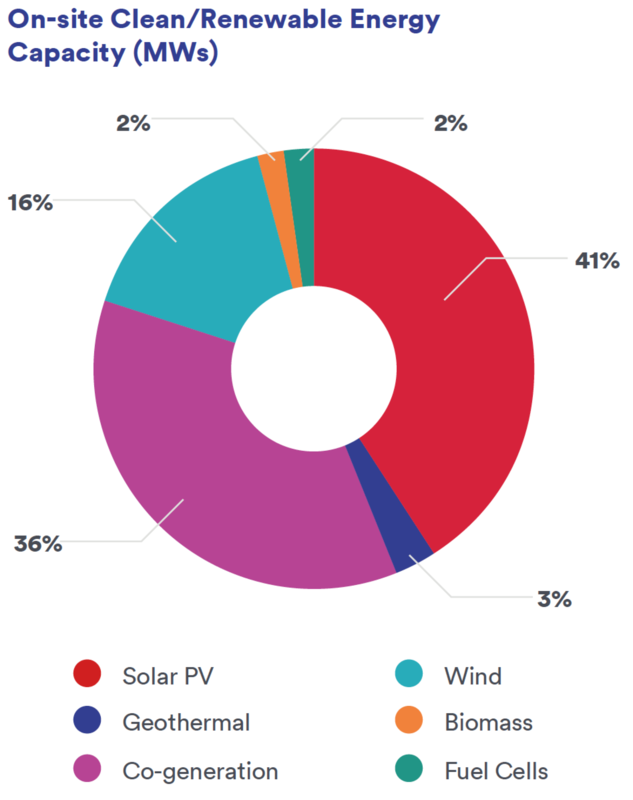 25% of total electricity consumption generated from renewable sources. In 2017, our Janssen plant in Beerse, Belgium, began construction on a project that would provide geothermal energy for campus heating and cooling, following multiple years of technical evaluation and dedicated on-site work. Our commitment to geothermal at the Beerse facility will involve investment in and construction of a new power station, plus installation of an innovative heating system that draws hot water from 1.6 miles below the earth’s surface. Once operational, the new system will reduce carbon emissions at the Janssen Beerse plant by an estimated 30%. We require all new buildings and renovations with a cost of at least $5 million and all new stand-alone buildings of a lesser value to be LEED-certified. LEED (Leadership in Energy and Environmental Design) is the most widely used green building protocol in the world. As a healthcare company, we value not only the environmental benefits of LEED certification, but also the public health co-benefits that LEED buildings deliver to our employees. In 2017, 13 new sites earned LEED certification. As a result, at the end of 2017, a total of 44 of Johnson & Johnson buildings were LEED-certified, covering nearly 7 million square feet of building space, or about 11% of our entire portfolio. Tracking and reporting Scope 3 GHG emissions in a comprehensive and meaningful way remains a challenge for us because of the diversity and size of our value chain, limitations in the accuracy of measurement protocols, and availability and quality of third-party data. Scope 3 emissions that we track include emission categories within our immediate sphere of control: employee business travel, electricity-related transmission/distribution losses, and limited downstream transportation emissions in the United States. We continue to explore ways to identify emissions hot spots within our value chain in partnership with our suppliers. Through our Sustainable Procurement Program, we encourage our suppliers to set—and to report on the progress of—public environmental goals, including targets related to energy use and carbon emissions reduction. For more information, see Responsible Supply Base section. Johnson & Johnson does not own the fleet used to transport our goods. We work with our transportation providers to optimize our network, using multi-compartment trailers, taking advantage of freight consolidation opportunities, eliminating deadhead miles (the number of miles that are driven from the point of unloading to the point where the new load is ready for pickup), and engaging in cross-shipper moves with other companies that have similar product lines. Johnson & Johnson participates in the U.S. Environmental Protection Agency’s SmartWay program, which helps companies voluntarily increase transportation energy efficiency while decreasing GHG emissions and air pollution. At the same time, the SmartWay Transport Partnership helps freight companies improve fuel efficiency, increase environmental performance, and increase supply chain sustainability. In 2017, Johnson & Johnson was recognized with the U.S. EPA’s SmartWay Excellence Award in recognition of our environmental performance and additional actions to reduce freight emissions through collaboration, operational practices, robust validating and reporting systems, communications and public outreach. * Includes site-specific data from all Johnson & Johnson-owned and -leased sites over 50,000 square feet, as well as manufacturing and R&D sites under 50,000 square feet, unless otherwise noted. ** Our diverse product portfolio makes it difficult to track an organization-specific metric, therefore we use revenues as a denominator for energy intensity. Energy intensity ratio includes electricity, stationary fuels, and district heating and cooling. *** GHG emissions were third-party assured by ERM Certification and Verification Services Inc. in 2015-2017. In accordance with guidance from World Resources Institute Corporate Accounting and Reporting Standard, we restated the 2015 and 2016 values to reflect newly released electricity grid emission factors as well as addition or removal of acquisitions and divestitures. We do not currently use purchases, sales or transfers of offsets. Gases covered in these calculations include CO2, CH4, and N20. Hydrofluorocarbons (HFCs) are disclosed in EHS&S Governance section. Perfluorinated chemicals, sulfur hexafluoride and nitrogen trifluoride do not result from our operations. 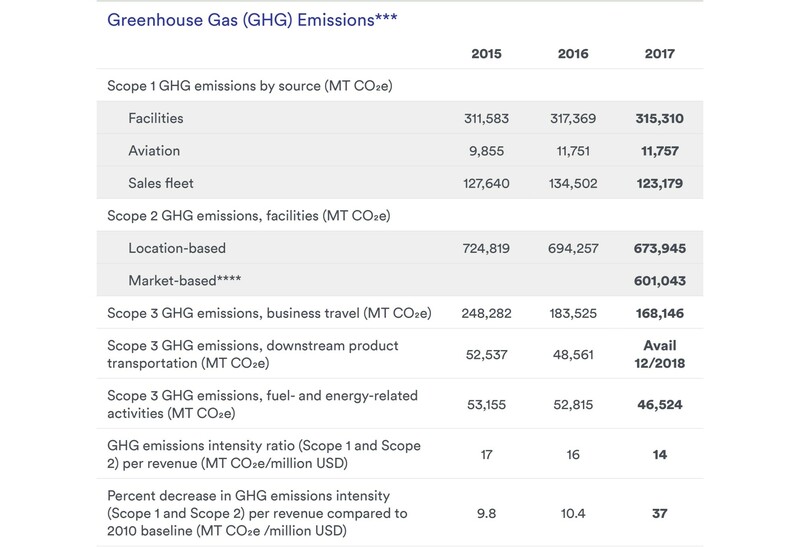 We do not calculate or report biogenic CO2 emissions in MT CO2e separately from the gross direct (Scope 1) GHG emissions. Electricity emission factors are obtained from the International Energy Agency’s CO2 Emissions from Fuel Combustion Report and the United States Environmental Protection Agency's eGRID publication for location-based Scope 2 reporting, and from supply contracts and residual emission factors, where available, for market-based Scope 2 reporting. Fuel emission factors are obtained from the EPA Climate Leaders publication. Global Warming Potentials are obtained from the Intergovernmental Panel on Climate Change Fifth Assessment Report. The chosen consolidation approach for emissions is operational control. **** We haven't previously reported Scope 2 emissions using the market-based method. Starting from 2017, we are reporting Scope 2 emissions using both location-based and market-based methods, based on the latest Scope 2 guidance from the World Resources Institute in the Corporate Accounting and Reporting Standard. 35 Assured by third-party, ERM Certification and Verification Services, Inc., for the period of March 1, 2017, to December 31, 2017.